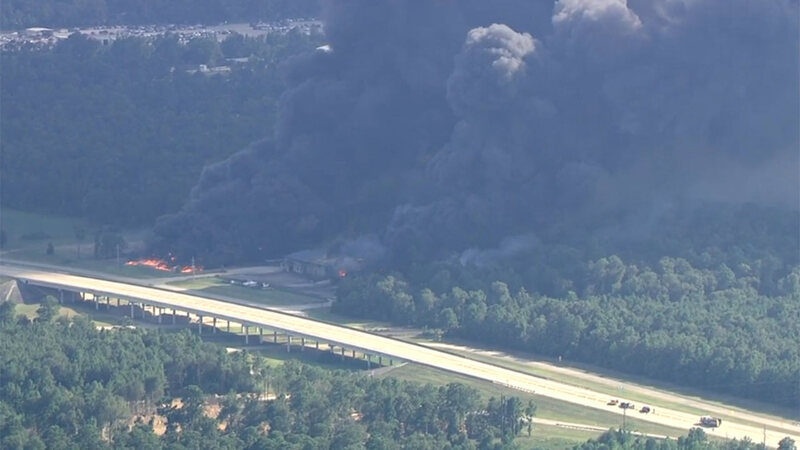 CONROE, TX (KTRK) -- A massive fire that destroyed the warehouse of a major lubricant manufacturer in Conroe last week has been ruled accidental. Fire officials say they still have work to do on the investigation into Friday's fire at DrillChem Drilling Solution, and they still aren't releasing names of the dozen or so chemicals that were inside. However, we know the company is a major manufacturer of lubricants, sealants and chemicals that help with drilling for oil and makes a number of highly flammable products. Conroe Fire Marshal Mike Legoudes Jr. says a ruptured tank sparked the fire, and firefighters were forced to go into defensive mode as soon as they arrived at the scene. Legoudes Jr. says they have not detected any follow up air pollution. And while the blaze was accidental, Legoudes Jr. says they still have to find the source of that accident. "There are several possibilities as to what the cause could have been. They include electrical, gas powered mechanical equipment in the shop as well as spontaneous combustion from oil rags used and disposed of, which is something we see occasionally," he said. A firefighter taken to the hospital for dehydration was released on Monday and has been cleared to return to work.